Joseph and Peter Palumbo of "Camelot Limos"
EPN Presents our Entrepreneurs of the Month: Joseph and Peter Palumbo, owners of the acclaimed limo company: Camelot Limos! These two brothers are truly a Dream Team! While many consider running a family business challenging, Joseph and Peter's successful collaboration prove otherwise. Why? Because their collaboration is based on trust, hard work, dedication and tenacity. 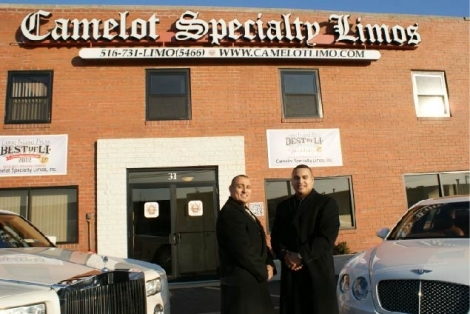 The EPN team recently visited Camelot Limos' Headquarters for our featured interview. Wow! Quite an Inspiring and Motivational Story! EPN: How did you get started in the car service industry...what is the story you would like the general public to know about the business? Joseph Palumbo: “Camelot Limos” was an investment that would have gone sour had my brother and I not taken it on as a business. In doing so, we worked 7 days a week for the first several years. We were lucky to have very supportive wives, from the beginning. We cleaned the cars, washed the cars, booked the cars, and fixed the cars ourselves. My brother and I at times both had to motivate one another to continue on and endure. EPN: What other business ventures/opportunities came from the risks you took taking over what you called a "dying business"? Joseph Palumbo: Well in my opinion there really is no such thing as a dying business. Every industry has a dying business that either has to (a) be reinvented or (b) you work harder to make it successful and profitable. You put in as much as you want to take in and the harder you work the luckier you will get. In this country you can be what you want to be and make the income you want to make because there is no magical pill or formula. Hard work, honesty, determination will lead you to the success you are looking for, no matter what they may be. It is no different than being a professional athlete. The pros didn’t just become professional athletes without working their butts off to get there. EPN: What challenges did you encounter and how did they make you a better business man in the long run. Joseph Palumbo: “What doesn’t kill you will make you stronger” I believe this to be true. Some days you don’t want the day to end, other days you can’t wait to put your head on your pillow. But at the end of the day it really is what makes you stronger, what makes you a better person and what makes you a better business person. People will come to you and ask how do you know this or that and how astute you are n business and it really is all about life experience. Common sense is so huge in business and in life, if you utilize it. Most people don’t and wind up complicating what is sometimes a very simple solution. Working as a team is really the secret to our overall success and sincerely gave us a huge advantage. The first couple of years my brother and I would feel that we couldn’t go on, our lives were really on such a brutal schedule. We relied on each other everyday. We relied on each other’s strengths. We picked on each others weaknesses. I’m more in the limelight and the “face” of the company. I usually get all the credit, because I’m in the front lines meaning I am the one people usually see and my brother controls the back office and the day to day inner workings of the business that are a lot less glamourous. However, I could never run the business without him because he is in charge of licensing, finances accounting, etc. The funny thing is that in all our years in business together we have never argued over money, not a day in our lives. We never argued about who makes more, or who makes less. We have always had the attitude of money will come and go, but being brothers and partners is a lifetime thing. EPN: What advice do you have for other upcoming entrepreneurs in your field and elsewhere (general advice from your personal experiences). Joseph Palumbo: There is no magic pill IN ANYTHING. You need “Strategy and Desire” to succeed. Simply put you need to have a plan and then the will and determination to execute that plan, and it WON’T be easy. At the beginning it will be very difficult. Surround yourself with good and honest people. When you run an honest ship, legitimately so . . .just being honest and being a God fearing person is all you really need to do. You do that, and good things will happen. Everything else will just fall into place. If your build your business on dependability and real character, your business will never go away. You have to build your business and your life with bricks and not sticks. A stick house can go up fast and look very nice, however it will blow away at the first real storm. A brick house will withstand all and be around forever. A real entrepreneur is not someone who thinks it’s all about him/her. A real entrepreneur is able to build a team, to get a following, someone who is able to control the masses by belief. To do people have to trust in believe in your character and work ethic. Your goal as an entrepreneur shouldn’t be to become a multi-billionaire. It is nice to work hard and make a good living. However I live by the following quote “make the dream a goal and make the goal a reality.” You can attain any dream, if you turn that dream into a realistic goal. Then make that goal a reality by sincerely following through on making a plan to make it work. EPN: How would you describe your business foundation/motto? Joseph Palumbo: Our motto is a lot like Disney's. I went down to Disney with my wife and kids and looked around ( When you’re in business, you’re always watching everything. You want to see what makes someone else great and how you can learn from their greatness) At Disney, people there are always so accommodating and friendly asking, “May I help you?”, and “What can I do for you?” I came back from Disney with my family and spoke with the staff. I said, “We are going to be the Disney of the Limousine companies. We are going to have the best rides, with the best customer service” This is how we decided to do it. 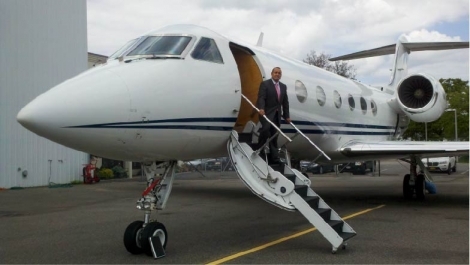 At Camelot Limo, Camelot Dream Homes (our real estate company), Camelot By Air (private aviation) We are not going to pass you along to 15 different people and keep you on hold waiting for an answer. Most businesses don’t realize that when you sincerely put your customer’s needs first (even if it means sending them to a competitor) you get all the business you can ever handle. During Hurricane Sandy, we didn’t miss a single job. Not one and it was probably one of the hardest jobs we had to do. My brother and I owe it all to our fantastic team who never once thought about giving in and who were all troopers through it all. Administration, maintenance, Drivers, everyone collectively stepped up. Joseph Palumbo: My Family – hands down. We have been truly blessed to have such a bond as a family. We all are a tight knit unit who have all sacrificed so much for eachother as well as all being God fearing people. With regards to our parents, we didn’t know how much they gave us. You never know how much they sacrificed for us, until you’ve become parents. My mother would walk through fire for my brother and me. She is one of those moms who would do anything for you. My dad, unfortunately, passed away from cancer at 56. It came out of nowhere. However my Dad was one of those men who wore their heart on their sleeve. He was always there for us and I sincerely cherish the wonderful memories we had with him. He never missed a little league game and coached us both for year. The only regret my brother and I have about my Dad is that we wish he could of enjoyed life more when it was his turn to do so. He always sacrificed so much for his family. He is truly our hero in every sense of the word. EPN: How would you like to expand your business - you mentioned Camelot Limo Air and possible Camelot by Sea. That's a brilliant idea...when and how would you start this project? Joseph Palumbo: I don’t think there is anything cooler than having a limousine company with awesome cars, being incorporated with yachts and air-crafts. EPN: While we were in the waiting room of your office, we saw many awards of excellence and various awards...I understand you do not like to boast, but do you mind describing some of them for our readers? Joseph Palumbo: We started with three antiques and built our business up over the last 8 years to become one of the best limousine companies in Long Island. Camelot Specialty Limos is the back to back winner and recipient of the 2012 and 2013 Best of Long Island. We have also respectively won “best of the Knot” 2012 and 2013, the best on LIWeddings from 2008 through 2012, have been winner of the Bride’s Choice Award on the Wedding Wire 2010 through 2012. We are also accredited Members of the Business Better Bureau. But even better than every award, is the many charities my brother and I donate to. Being able to give and seeing the difference you make with others is truly a blessing in itself. EPN: Is there anything you'd like to add to your success story? Joseph Palumbo: It just kind of happened. Some things came with hard work, some with luck and some just by accident. A very true statement we live by is that “Man Plans and GOD Smiles.” Do the very best you can each day, so you wake up and like that person you see in the mirror. I want to be able to say that my brother and I are “jet-setting business guys who have fancy degrees”. My brother Peter and I are two regular guys who worked their butts off to get to where we are today. Most importantly, we have both never stopped being so grateful for our blessings. The Camelot Enterprise will always have a team concept. It is never about any one person or individual. We have no superstars. We are a team, always will be. We are only as good as the family that supports us and the staff we are fortunate enough to employ and the clients who trust us day in and day out, in all of our businesses and business ventures.